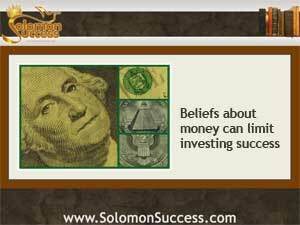 Belief and trust in wisdom can guide us to a more prosperous life, says King Solomon. And letting go of the limiting beliefs that put up barriers to new ways of seeing things can be the first step toward making room for the wisdom that leads to prosperity. And for today’s investors, shifting from a mindset of scarcity to one of abundance can set the stage for investing success. Why? It’s a matter of consistency, say practitioners of abundance thinking. If your conscious mind wants to build wealth and is trying to take steps to do that, but the subconscious is holding on to old, limiting beliefs, you may sabotage your investing efforts without realizing it. When a team with a long losing record comes within a basket, or a touchdown, of winning, they often blow it. And coaches say they don’t know how to win. The team has been losing so long that they’ve come to see themselves as losers, not winners, so when the opportunity to win comes along, they don’t know how to take advantage of it. Advocates of cultivating abundance say that half the battle is switching to a belief in abundance – that wealth and other things you want really can become a reality. A “scarcity mentality” keeps investors from taking risks, trying new strategies – or even from starting an investing career at all, because they don’t see a positive outcome ahead and they need to hold on to what little they have. But a belief in abundance – that resources are available and profits will come – can open doors to new opportunities and reduce the fear of risks. Many people learn that scarcity mindset when they’re very young, especially if they’ve lived in financially limited circumstances, so it can take some work to discover and challenge those limiting beliefs about money. Visualization helps, say lifestyle coaches and psychologists. Acting “as if” you’re already wealthy can release some of the barriers to gaining wealth. That can mean something as small as creating a collage of pictures that reflect the reality you’re trying to create, or imagining your bank account with a few more zeros. Affirmations can help some people, too. Saying every day, “I live abundance,” or “I’m creating wealth every day,” can send new messages to the subconscious about the new reality you want to create.